I am done with growing sweet potatoes in raised beds. Here is a very bad photograph to explain why. 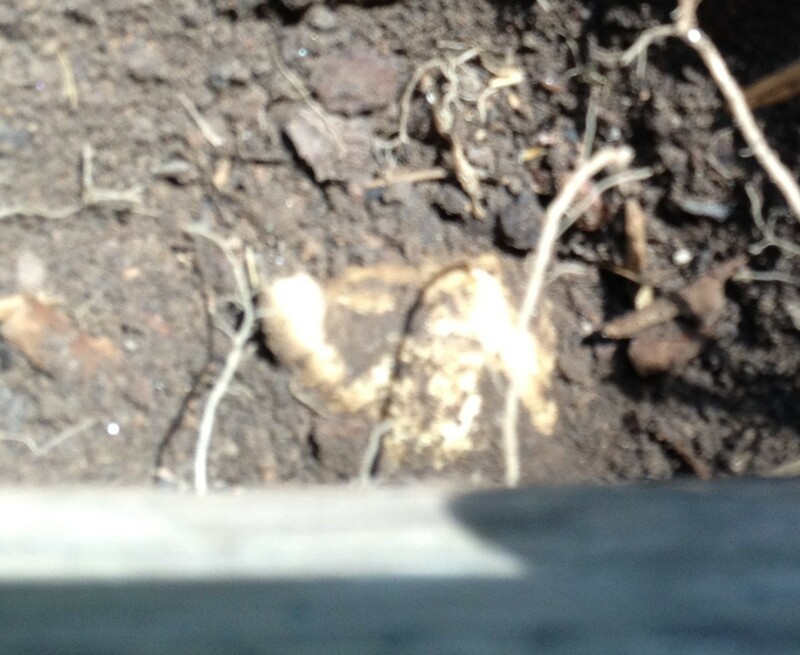 The vague white-colored object at the bottom is one of my North Carolina White sweet potatoes, which formed below the level of the raised bed edge (about a foot down) and under it. I had to pry it out with a soil knife while keeping all the loose soil from falling back into the hole. Today I was just digging a few sweet potatoes for dinner. It’s going to be some kind of fun getting the whole crop out. Oh well – my raised beds are falling apart anyway, so I might as well dismantle them while harvesting. To the far left is one skinny All Purple sweet potato. As with NC White (which you can see just above it), the tubers form deep in the soil at the end of long roots, so I’ll really have to dig to find them. Luckily, my orange Ginseng sweet potatoes are of the type where the tubers cluster around the base of the plant, so I managed to snag a bunch of those pretty easily. Today’s advice: know the growing habits of your sweet potatoes before trying to plant them in raised beds. Long-rooted types: probably not such a great plan. At the Derwood demo garden, we plant sweet potatoes inside an oval cage of hardware cloth, which is placed in a six-inch trench and then filled with loose soil to about 15 inches high. This protects the sweet potatoes from voles and mice. It also means that when the initial digging is done inside the cage (at the Harvest Festival, October 6!) we can remove the cage and explore the area thoroughly for stragglers. Surprise harvest: always nice, at least when it’s easy to find. I’m glad to see I actually have sweet potatoes, since some critter got into my garden in August and ate all the vines, and I was worried the plants wouldn’t have the energy to form tubers. The vines have grown back now, so I’ll have sweet potato greens to harvest and cook as well. You said you were digging sweet potatoes for dinner. Are you planning on curing them first? I grew sweet potatoes last year. The size was disappointing and so was the flavor because I didn't know I needed to cure them before eating. Storage and Preservation: Ideally, try to cure the roots at 85 degreese F and 90% to 95% RH for 4 to 8 days. Curing causes conversion of starch to sugar. After curing, store at 55 – 60 degrees F at 85% to 90% relative humidity. Your harvest looks like it will be pretty tasty! Let us know the difference in taste between the varieties. Yep. Need to cure them. I know, you're both so right, but I am always impatient for the first harvest. I promise I'll cure the others. And really, though the orange ones could use more developed flavor, the white ones were properly sweet and dry, and the purple one! Wow. Rich and complex like red wine. I look forward to more of those, even if I have to dig deep for them. Can you share a picture of those hardware cloth cages? I'm intrigued. Did the animals eat the whole vines or just the leaves off the vines? I had a similar experience. I went on vacation for a week and came back to sweet potatoes vines that had had every single leaf eaten off of them. They looked like porcupines. They all grew back though, and I've been getting sweet potatoes. They're a pretty resilient plant, I think. They ate just the leaves – sorry, lazy in my language! And yes, they come back remarkably fast. I could have sworn I had a photo in a blog entry somewhere, but I can't find it. There is a picture of the trench here. After that, we form an oval to fit, about two feet high, and fill soil in around it. Darn voles and mice! I am going to try the hardware cloth next year. Although it is very satisfying to catch them in traps, it is not very effective. I grow my sweet potatoes in potato bags next to my raised bed. I’ve had great success doing this and great size tubers. Thanks for the tip. I've heard varying things about results using this method. Maybe the difference has to do with variety. Stinks about the animals. Good idea to grow them in a cage. 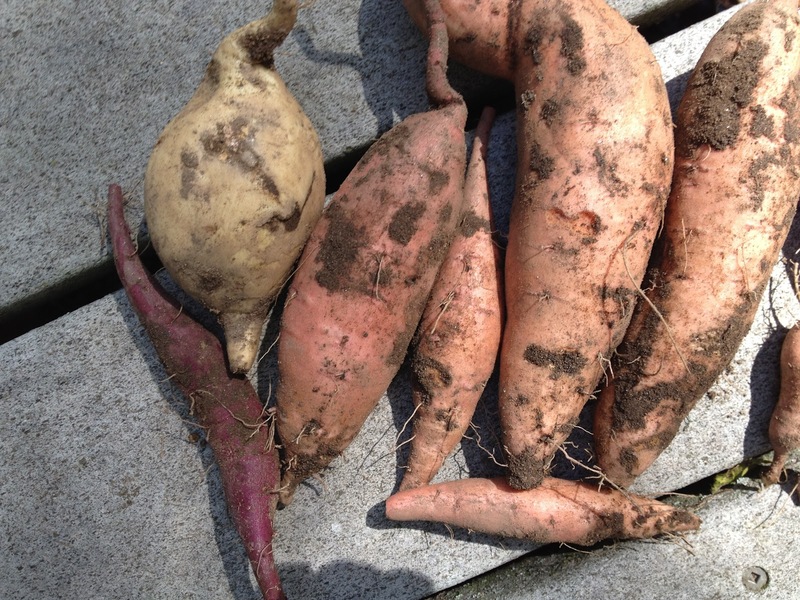 The last time I grow sweet potatoes I grew them in hills as tall as i could manage and they did really well. Love those deep scarlet ones.